Due to the recent windstorm, the trails in the park have suffered significant damage and the trails are inaccessible due to downed trees. Members of the public are discouraged from accessing the park until appropriate assessments can be completed to ensure the park is safe. Located on Holden Lake south of Nanaimo, this forested park is popular with local residents, who mainly come here to explore the extensive trail system. The marsh area at Hemer Provincial Park is also a favourite destination for bird watchers and ornithologists. A viewing platform over the marsh, approximately 1 km from the parking lot, provides the opportunity to observe various types of ducks, Trumpeter swans, Bald eagles and turkey vultures, as well as beavers. Approximately 11 kilometres of easy walking trails weave through the park along Holden Lake and through the marsh areas. The trails are forested, primarily with mature coastal Douglas fir, red alder and big-leaf maple. Trails are not marked but are easily identifiable and well maintained. Hemer Park provides day-use opportunities at Holden Lake, a peaceful setting for paddlers, boaters and anglers. Dogs must be kept on a leash and under control at all times to protect nesting birds and other wildlife. Lock all vehicles and remove valuables. Bring your own drinking water as potable water is not available in the park. All surface water must be boiled, filtered or treated before consumption. Hemer Provincial Park is located on Holden Lake, 12 km south of Nanaimo on southern Vancouver Island. Take the Cedar Road turnoff from Hwy 1 and follow directional signs to the park, which is situated on Hemer Road. Nearby communities include: Nanaimo, Yellow Point, Ladysmith. 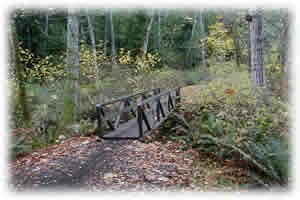 History: Hemer Park was a gift from John and Violet Hemer of Cedar, BC in 1981. Homesteaded in 1860, the park still contains remains of the farmstead, offering a look at the region’s farming history. The Pacific Coal Company railway traveled along the shores of the lake; their abandoned right of way now forms a trail called Heritage Way. Conservation: The forest is a mixture of coniferous and deciduous trees including second-growth Douglas fir, red alder and big-leaf maple. The marsh is an important wetland habitat that supports a wide diversity of specifics. Holden Lake is home to trout, minnows and sculpins. The lake is also one of only two lakes on Vancouver Island that contain the Pea Mouth Chubb. This fish spawns in the creek between the lake and the marsh at the end of April. Holden Lake offers good opportunities for angling for Cutthroat trout, however there are restrictions on the lake. Fishing is permitted as per provincial and federal fishing regulations. All anglers should check the current regulations issued by Fisheries and Oceans Canada prior to fishing. Anyone fishing or angling in British Columbia must have an appropriate licence. There are 11 km of easy walking trails that run through the park along Holden Lake and through the marsh areas. The trails are forested, primarily with mature coastal Douglas fir, red alder and big-leaf maple. Trails are not marked but are easily identifiable and well maintained. For your own safety and the preservation of the park, obey posted signs and keep to designated trails. Shortcutting trails destroys plant life and soil structure. At this time Horses are permitted on the upper trail behind the service yard. We ask that horse riders take the time to kick any horse dung dropped by their horses off the trail. Pets/domestic animals must be on a leash at all times. You are responsible for their behaviour, and must pack out and dispose of their excrement. Backcountry areas are not suitable for dogs or other pets due to wildlife issues and the potential for problems with bears. This day-use only park has no designated picnic facilities; however there are a number of park benches where visitors could enjoy a picnic. Other facilities consist of an extensive trail system and 2 pit toilets. This park has 2 pit toilets, located approximately 50 metres from the parking lot on the main trail.